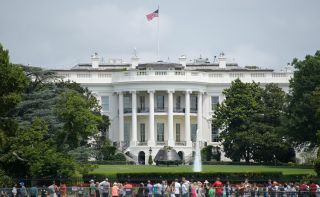 An Orion capsule that NASA flew during an uncrewed test flight in December 2014 visited the White House July 23, 2018. The longest government shutdown in U.S. history is over. President Donald Trump announced today (Jan. 25) that he'll sign a temporary government-funding continuing resolution (CR), ending the five-week partial shutdown that shuttered much of NASA, among other government agencies. The new CR includes no money for a border wall, sources told CNN. Today's news will hearten the roughly 800,000 government employees who had either been furloughed by the shutdown or forced to work without pay. NASA was particularly hard-hit; the space agency had to furlough more than 95 percent of its workforce. "I will make sure that all employees receive their back pay very quickly or as soon as possible," President Trump said during a news conference today. "It will happen fast." But today's announcement is far from a lasting fix. The CR covers just three weeks, keeping the government open through Feb. 15. And the president said he'll continue pushing for wall funding, raising the prospect of another shutdown or an emergency declaration. "If we don't get a fair deal from Congress, the government will either shut down on February 15 again, or I will use the powers afforded to me under the laws and the constitution of the United States to address this emergency," President Trump said. And even if the government stays open far beyond Feb. 15, the nation's space program has already incurred potentially serious damage, exploration advocates say. For example, some smaller NASA contractors have already had to lay off large chunks of their workforce because government checks haven't been coming through. And the recent dysfunction may cause smart and talented people to think twice about working for NASA or any other government agency. "The damage has been done, in terms of the loss of confidence in the system that invests in this critical long-term research and development process that has been one of the driving forces in making the United States one of the leading countries — really, the leading country — in technology and industrial strength and scientific research," said Casey Dreier, senior space policy adviser at The Planetary Society, a nonprofit organization that advocates for space exploration. "We've broken a contract with the people we ask to do some of the most difficult and inspiring and important work," Dreier told Space.com. "We've told them, 'You're not important enough.' And we can't undo that." Space.com Senior Writer Meghan Bartels contributed to this story. Mike Wall's book about the search for alien life, "Out There" (Grand Central Publishing, 2018; illustrated by Karl Tate) is out now. Follow him on Twitter @michaeldwall. Follow us @Spacedotcom or Facebook. Originally published on Space.com.